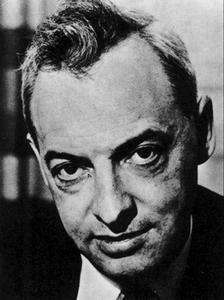 Raised in a family of Russian-Jewish immigrants to America, Saul Bellow's mother wanted him to become a rabbi. He became a novelist instead, writing dark, introspective tales about protagonists similar to Bellow himself — 20th century Jewish men, heavy thinkers wrestling with their identity and sense of hopelessness in a neurotic, harsh, and urban society. Most of his writing was set in Chicago, his adopted home town, which emerges almost as a recurring and beloved character in his books. He wrote about life as he saw it, and took delight in challenging what was deemed appropriate to put on the page. He shrugged off complaints of misogyny, vulgarity, and racial stereotypes in his writing, and showed an obvious antipathy toward the counterculture movements of the 1960s. His first novel, Dangling Man (1944), is set in the home front during World War II, where a fatalistic young man quits his job and waits to be drafted into the Army. His most widely hailed works include The Adventures of Augie March (1953), about an immigrant making his way and becoming "American" in Chicago; Seize the Day (1956), about a man who tries to free himself from a frustrating, un-fulfilling life; and Herzog (1965), about a middle-aged man of many faults, wrestling with existential questions as his life goes increasingly awry. Mr. Sammler's Planet (1970) is perhaps Bellow's quintessential work. An underappreciated gem, it tells the story of an aged Holocaust survivor whose desperate attempt to disengage from modern life is thwarted by a chance encounter with a pickpocket. All this sounds bleak indeed, but what emerges from Bellow's work is a curious and unexpected sense of optimism — that life is worth the effort because of its inherent difficulty, futility, and risk. Bellow said he was first drawn to literature by reading Harriet Beecher Stowe's novel Uncle Tom's Cabin while hospitalized as a child. Years later, he decided to quit college and become a writer while he was studying for a graduate degree in anthropology at the University of Wisconsin, and "every time I worked on my thesis, it turned out to be a story". Herzog was by far his best-selling novel, and Seize the Day was made into a movie with Robin Williams in the lead role. Among his many honors, Bellow was awarded the Nobel Prize for Literature in 1976. He died in 2005.